Wing Commander: Armada is perhaps the least essential of the Wing Commander games, dispensing with the cinematic personality that's the hallmark of the series in favor of pure cockpit action wrapped up in a simplistic, overarching strategy game. I was a little harsh on Wing Commander 3 and 4 last week, in large part because of the awkward, awful FMV sequences around which the games were built. 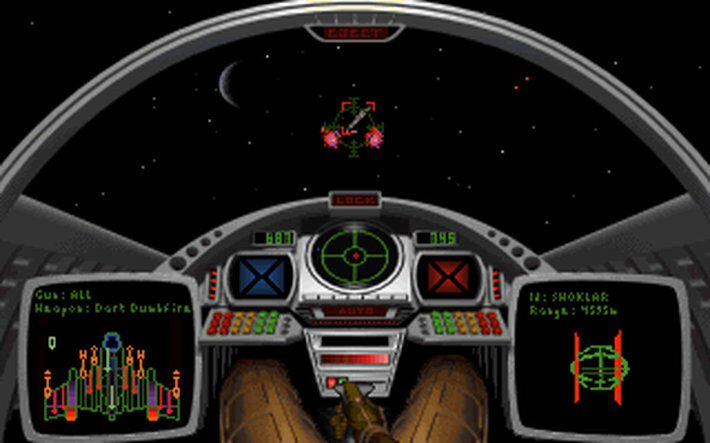 You won't have to worry about that with Wing Commander: Armada, though, because it features no FMVs or cut scenes of any sort for that matter. It's all about the interstellar yank-and-bank, with no heed paid to things like story and script. For gamers inclined to pound the escape key the moment anything resembling a plot rears its head, that's probably a good thing. 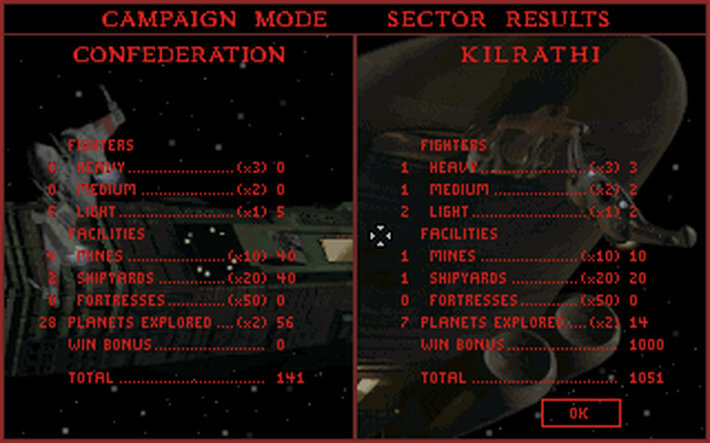 In a Wing Commander game, however, it feels strange. 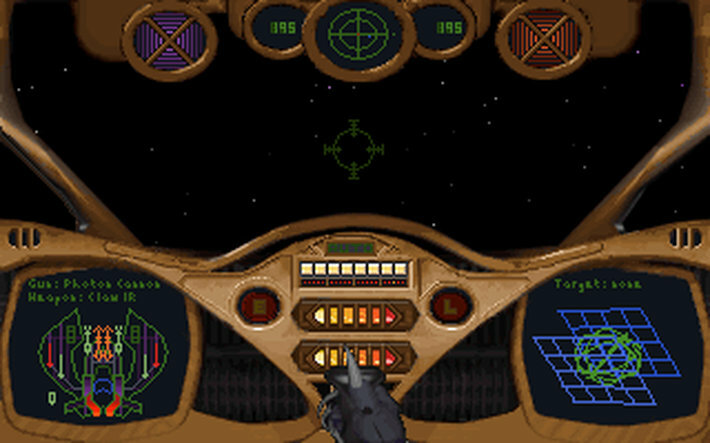 Wing Commander was all about wingmen, like Angel, Paladin, Hobbes and Maniac, but nobody in Armada has a name, and if you're killed in action in one of the game's strategy modes, you simply hop into the cockpit of your wingman's ship and pick up the action from there. 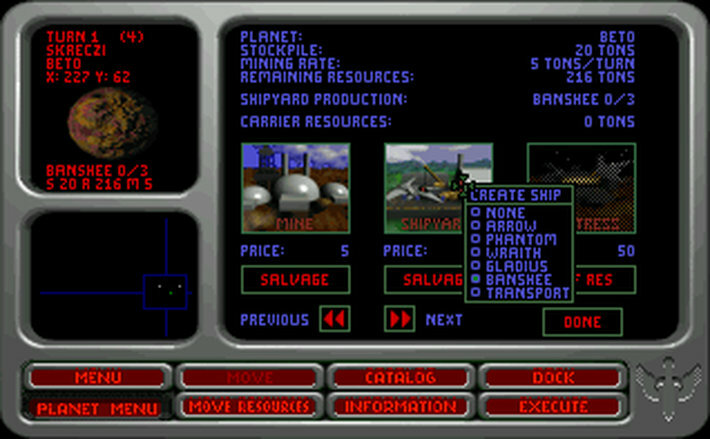 The strategy aspect is very basic: Orbit a planet, build a mine, shipyard and/or fortification and then provide them with simple instructions like what kind of ships to build or how rapaciously to strip the world's resources. Planets are connected to one another through randomly assigned "jump lanes," for lack of a better term (I didn't get a proper manual, so I'm winging it a bit here) so it's often easy to defend clusters of planets by stocking choke points with heavy defenses. 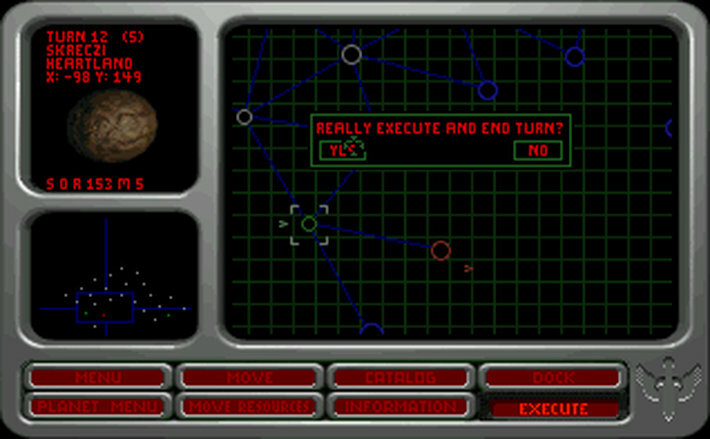 Unfortunately, while planets will continue to build fighters until you tell them to stop, you can't direct those ships to automatically move to set waypoints, and manually guiding your forces around the galaxy every turn eventually grows tiresome. But what really matters is the cockpit action and in this regard, Armada is almost indistinguishable from the first two Wing Commanders. The sound effects are decent (for a game of that age, anyway) but the music is weak - anemic, you might say - and although the visuals are very dated, it's still a very pretty game in its own retro fashion. 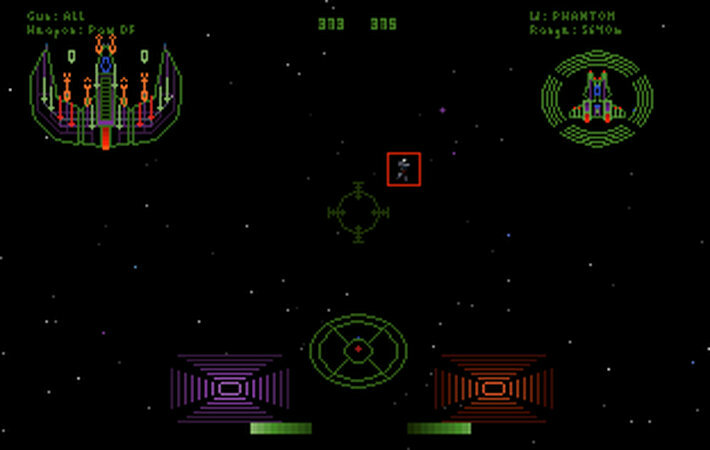 Sadly, it's not very sophisticated, as enemy fighters tend to either fall back on flat turns, making them easy targets, or engage in head-on chicken runs, which gives a real edge to the guy with the heavier ship. Life is good once you're in the cockpit of a Wraith or a Banshee, but the nature of the can make ships like the lightweight Arrow outright tedious when you have to use one to slowly work over a tank-like Jrathek. There's no mouse control and there's no way you should be playing a game like this with the keyboard, but the joystick can be a struggle too; after unintentionally skipping the joystick alignment process, I couldn't figure out how to get back to it and was ultimately forced to uninstall and then reinstall the game in order to be granted another run at it. It worked fine after that, and there may well be a way to access the menu from within the game, but without a proper manual I couldn't figure it out for the life of me. 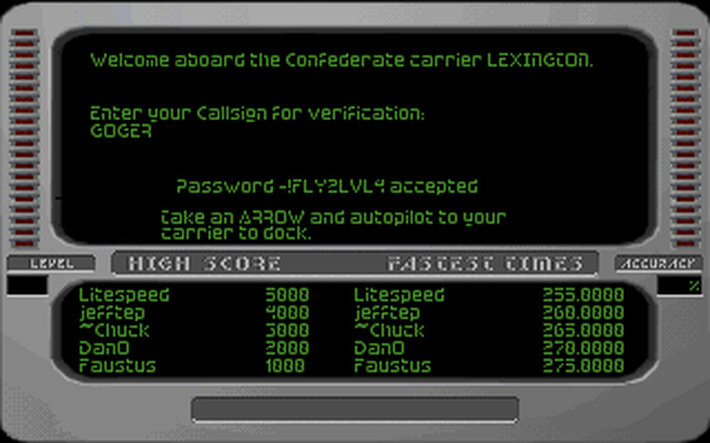 (The list of controls on the Wing Commander Encyclopedia makes no mention of it, either.) 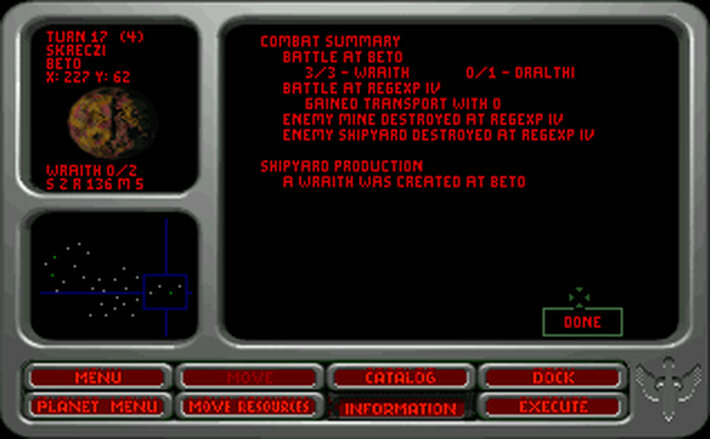 The GOG edition does come with a PDF version of the "Voices of War" manual, an excellent, fictionalized account of the war from the perspectives of both Human and Kilrathi soldiers (and also a sad reminder of the effort that used to be put into supporting documentation), and although it doesn't tell you much about actually playing the game, it's probably my favorite part of the whole thing and a must-read for any Wing Commander fan who hasn't had the privilege. 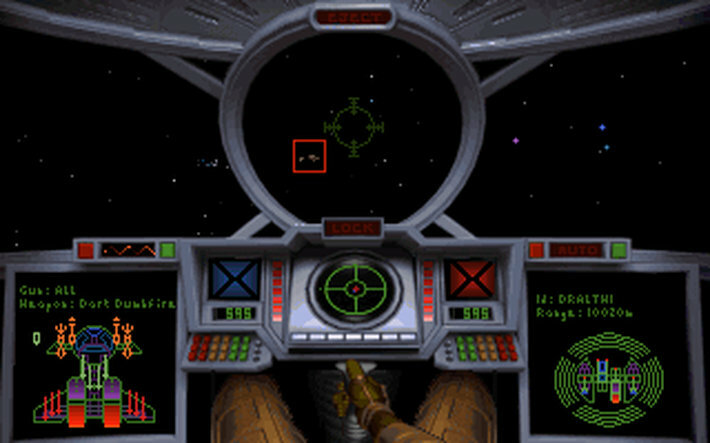 It might seem unfair that after dinging Wing Commander 3 and 4 so badly for their painful FMV sequences, Armada loses points for having no overarching narrative at all, but the truth of the matter is that the original Wing Commander succeeded because it struck upon a perfect balance of cinematic experience, narrative gravitas and intense cockpit action. But without the first two elements to give it purpose, the third suddenly seems far less compelling. 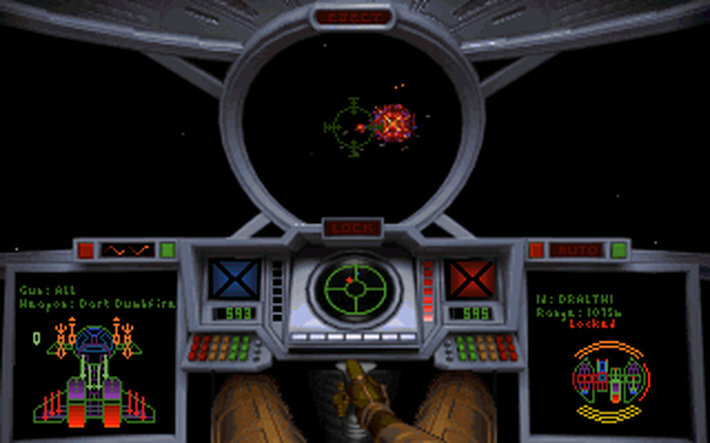 Wing Commander was a great game but it was never a great space sim, and its weaknesses are rather starkly exposed in Wing Commander: Armada. 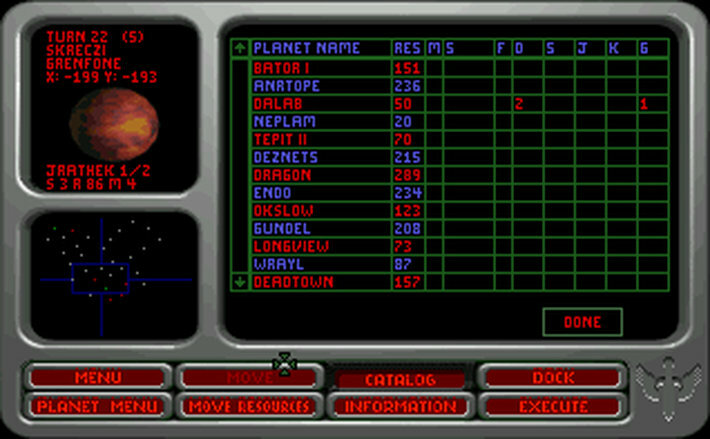 Serious nostalgia buffs might get a kick out of it, but there are better space combat sims out there, and better Wing Commander experiences too. 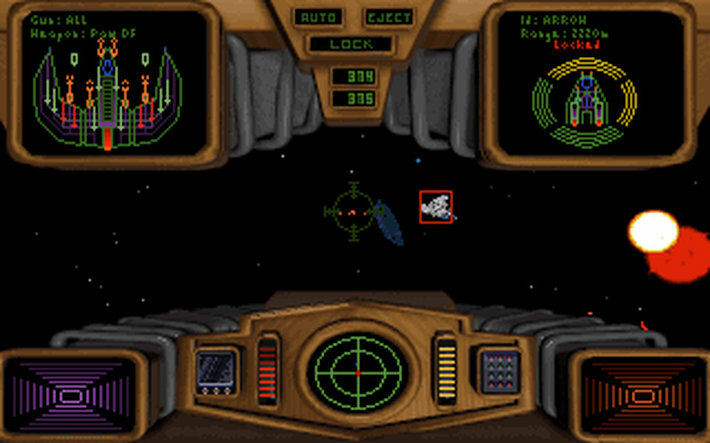 Even so, if you want to give it a try Wing Commander: Armada is available at GOG for $5.99. Next week brings a new month and a new round of retro reviews. In December we'll be focusing in on classic PC RPGs, starting with Marshall Lemon's take on Wasteland.